Hudson Bay represented a commercial zone rather than a colonial environment until the 19th century. The Cree and the Chipewyan brought furs from across the drainage basin of the bay to the HBC’s shoreline posts. The Europeans huddled in their forts, living off food supplies from Britain, and bracing themselves against the climate, mosquitos, isolation, and the fearsome sound of pack ice on the northern sea. It was an unambitious but lucrative strategy, because even a fraction of Rupert’s Land had the potential to produce huge quantities of beaver pelts. The HBC traders thus acquired a reputation for “sleeping by the bay” and their apparent inertia continued until 1775, when they had to burst out of the coastal sanctuaries and push into new trading relationships. 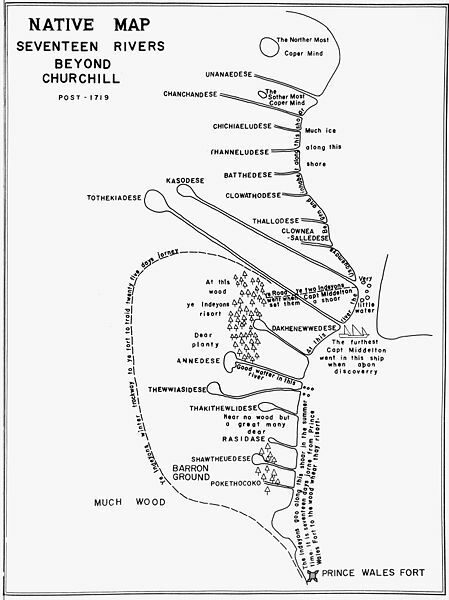 Figure 8.6 A complex map of the Chipewyan territory north of Prince of Wales Fort, ca. 1716. It derives from Aboriginal sources (the topographic features) and British observations about navigational and human migration features. Cree trade goods continued to head south to New France (and, after 1760, to British Canada), and Aboriginal traders around the bay developed alternative strategies for success. Establishing a middleman cordon around the HBC forts — called a home guard — ensured that bands that had a prior claim to the territory enjoyed first access to trade goods. And they could charge a tariff on other, visiting Aboriginal traders. The HBC encouraged this arrangement because it improved their access to skilled hunters and, thus, fresh meat. For the lowland Cree and the Chipewyan it provided access to trade goods, including foodstuffs imported from Britain. Relations between the Cree and the Europeans were uneven. Cree priorities were critically important. Treaties or agreements of some kind were reached by the Cree with the 1668 exploratory expedition that resulted in Fort Charles (Rupert House). Those documents have not, however, survived. Whether written or verbal, agreements were sought and reached at every site occupied by the English and the Cree alike. The Cree were looking for reliable and long-term commercial alliances, not incidental trade opportunities. Conflict in this environment was both familiar to and distinct from what occurred in the eastern woodlands. As one study points out, “Living conditions in the North did not allow for wars: Amerindians and Inuit may have killed each other on sight (if they could), or even raided each other, but this never led to military campaigns as such.” Another scholar of the region, however, points to the advantage enjoyed by the Cree in battle because of their access to British guns and how they used these very effectively against the Chipewyan and other Athabascan-speakers. What historians agree on is that there were no “wars” but there was “warfare,” and it was both bloody and nearly catastrophic for the underequipped and badly outnumbered Chipewyan. Their numbers may have been reduced by hundreds if not thousands. Henry Kelsey’s expedition into the parkland of north-central Saskatchewan via the Nelson River in 1690-92 reported almost continuous conflict between the Cree and their northern neighbours. Athabaskan slaves were regularly encountered in and around York Factory, a sign of the effectiveness of Cree raiding parties. The predations by the Cree extended deep into the subarctic. In 1715 HBC regional Governor James Knight sought to put an end to the conflict and placed his trust in an escaped slave of the Cree, an adolescent Chipewyan woman named Thanadelthur (ca. 1697-1717). Knight hoped she would act as an intermediary between a large party of Cree and representatives of the Chipewyan, whom they would have to seek out. For her part, Thanadelthur’s aims included opening a supply line of arms to the Chipewyan and some commercial success for her immediate family. The success of the peace mission has always been ascribed to the oratorical skills and persuasive powers of Thanadelthur who is said to have entreated both sides for hours until her voice failed. The Chipewyan had much to gain — including the promise of an HBC post in their own territory and a supply of guns to level the balance of power in the North — but they had much to lose as well. The Cree were more than capable of overpowering the Chipewyan, and it is almost certain that the former were relinquishing access to territories to which they had some ancestral claim (real or imagined). Discerning motivations in 1715 is difficult in part because so many of the key pieces on the board are difficult to identify. What we can say with some certainty, however, is that the 50 years after the fall of Wendake (Huronia) and the course of the Beaver Wars had witnessed significant change in the Cree situation. Populations from the Great Lakes were heading west in large numbers. These included the Anishinaabe (Ojibwa) with Wendat refugees in their midst, along with some Woodland Cree, whose most recent homeland was between the Innu, Nippising, and Anishinaabe to the south and the Lowland or Swampy Cree to the north. As the Great Peace (1701) took hold, populations began to recover, which added to increasing resource pressures. The Sioux, the Grôs Ventre (who are variously identified as the Snake, Atsina, or Hidatsa but not all three at once), Arapaho, and Assiniboine were all being pushed west as a result. The Cree, who had the best access to British guns, enjoyed a period of population growth and aggressive expansion out of the lowlands, across the parkland and onto the Plains. In the North they harried, as we know, the Chipewyan but also the Dogrib (Tlicho) Dene and the Dunne-za (another Athabascan-speaking people who were driven westward into what is now British Columbia). Even the Plains Cree were being negatively impacted by a coming generation of newer Plains-bound Cree. The Cree-Chipewyan peace of 1715 enabled a rapid extension of Cree and British influence from Prince of Wales Fort (a.k.a. Fort Churchill) on Hudson Bay to communities deep in the subarctic, the spread of guns and iron products into the North, and growing trade dependence on the part of the Chipewyan. Achieving peace in the North cost the Cree little and allowed them to hold the line of their expansion at the Churchill River. And from 1717 to 1759 the Cree were able to act as middlemen between the HBC and Athabaskan-speakers as far west as the Peace River District. None of this should lead us to think there was a common “Cree agenda.” Neither the Lowland, Woodland, Subarctic, nor Plains Cree had the kind of political unity that allowed for a single diplomatic purpose in the North, on the Prairies, or with regard to the Europeans. This disunity was also flexibility: unlike the Blackfoot or even the Anishinaabeg, the Cree bands could develop several strategies at once, and they had the numbers to make a difference. The arrival of European technologies in the North did not occur in a static physical or social environment. Around 1700 the North American climate was changing, becoming colder overall. Areas of human occupation were shrinking or moving south, something that was apparent in the high Arctic where the Thule abandoned ocean islands and concentrated on the mainland coast. This produced some unusually large communities, such as Kittigazuit, a Siglit village at the mouth of the Mackenzie River, whose population reached 1,000 to 2,000 individuals. This was the largest collection of households between Siberia and Greenland. What’s more, the architectural challenges of living in a colder climate saw the end of stone- and/or turf-constructed dwellings, and the appearance of igloos and tents. These developments were all part of the transition from the older Thule culture to the emergent Inuit culture, one that depended on smaller bands hunting for caribou and muskox on land, and whales, walrus, and seals at sea. The guns of the 18th and 19th centuries would have been useless to whalers; people with a more eclectic appetite would find more use for firearms. Similarly, the Cree market for European goods related to their own needs but also to evolving conditions in the West. Principally the Cree sought European goods that they could trade to other partners. As much as they wanted some European products, their chief goal was to obtain Aboriginal products from neighbours to the south and west. What they traded for in the North, therefore, had to have an appeal beyond the Cree themselves. The loss of Wendat farm products had the effect of refocusing northern trade toward the last major Aboriginal agricultural societies in the region: the Mandan-Hidatsa. These midwestern settlements were also where the Cree and other northern peoples would find access to Spanish trade goods, including horses. In short, some of the material the Cree traded for at Hudson Bay might have limited or no value to the Cree; demand for British imports in trademarts more than a thousand kilometres inland determined their currency value. Guns offer a good example. English-made guns in this era were muzzle-loading. They required powder and shot. The flintlock was, in the 18th century, just overtaking the matchlock musket and both kinds of guns could be found in the West and the North. The metal from which the English guns were made did not perform especially well in extremely cold temperatures. Stories of misfires blinding the shooter are common enough, as are examples of guns being repurposed into spears and other tools. In short, they were awkward to use, dependent on imported supplies like gunpowder that could run out and thereby render the musket just dead weight, and on the whole were unreliable. They could, however, fetch a good price in the Mandan-Hidatsa villages. This is what made the Iron Confederacy so successful in the 18th century and into the 19th as well. The Cree could access British goods, the Assiniboine had entry into the central Plains marketplace, and the Anishinaabe, for their part, could secure French/Canadien/Canadian goods. The ways in which that eastern trade system integrated into the West and North was to drive cultural and commercial evolution across the region. The HBC trading strategy was to build strong, fortified posts on Hudson Bay with substantial warehousing capacity and to wait for the furs to come to them. Aboriginal groups in the North — especially the Lowland/Swampy Cree — operated their own monopolies in trade that extended from the bay to the Peace District and the Upper Mississippi. Aboriginal traders were motivated to engage with the Europeans by their desire to own products generated by other Aboriginal peoples, including horses. Native Map Seventeen Rivers beyond Churchill 1719 (1969) by Wyman Laliberte is used under a CC-BY 2.0 license. 8.4 Commerce, Collusion, and Conflict in the 18th Century by John Douglas Belshaw is licensed under a Creative Commons Attribution 4.0 International License, except where otherwise noted.